Alfreda “Freda” Lanoix, author of “Go to Hell”, is as irreverent and audacious as her new book. Fearlessly truthful and extraordinarily insightful, she views the world through a multi-faceted lens of laughter and self examination. Freda has been a mover and a shaker her entire life. The truth is, she had to be. Born in Kansas City, Missouri, in 1955, Freda was the eldest of six children, charged with the responsibility of raising her siblings. Most of her time and energy was devoted to caretaking, peace keeping, and making sure that her brothers and sisters felt loved and nurtured. The resulting desire to help those around her feel good about themselves became a need that would ultimately shape Freda’s adult life. Freda left home at the age of seventeen, headed to Los Angeles in search of a connection with the father she never knew. That connection didn’t happen– but life did. Freda married, gave birth to a son and daughter, gradually accepted her sexual orientation, and ultimately was ordained in 1995 as an openly lesbian minister for Unity Fellowship Church of Christ. The following year Freda was named Unity’s Assistant Pastor, and in 1999, Rev. Elder Alfreda Lanoix became the Pastor of Unity Fellowship Church. Freda served as Board Chairperson of the Unity Fellowship Church Movement, Chief Operations Officer for the Minority AIDS Project and Love Is For Everyone, Inc, and Director of Marketing for L.I.F.E. Records. She was named Interfaith Committee Chair of the Los Angeles County Second District HIV/AIDS Community Coalition and served on the Statewide HIV/AIDS Church Advisory Board. Over the years, she received numerous awards and commendations from her colleagues, peers, and the city of Los Angeles for her tireless service. As a pastor, however, Freda was struggling. The biblically-based, Christian ideology that she was offering to her congregation every Sunday, was leaving her feeling increasingly unfulfilled, and ultimately like a hypocrite and imposter. In 2002, Freda resigned her ministerial position at Unity, freeing herself from what she describes as the restrictive “walls of religion” and the “hell of ministry”. A temporary relocation to Seattle, Washington followed, forcing a period of painful self-examination that ultimately led Freda back to Los Angeles to begin what she calls a “spiritual movement”. She founded Love at Work … The Exchange, a weekly gathering that is equal parts group therapy session, metaphysical lecture, social get-together and new school revival, which, by design, is blurring the lines between race, religion, spirituality and sexuality. Freda is currently in demand as a workshop facilitator, keynote speaker, lecturer, conference trainer and guest panelist. 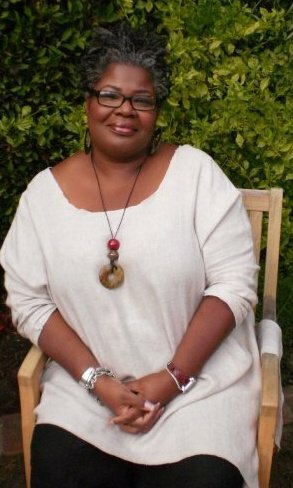 Among a host of appearances, she was recently featured in a Logo Network special entitled “True Lives”, which focused on her experiences as a black, lesbian mother; featured in a documentary called “Finding God In The City Of Angels”; and was guest on the public affairs radio program “Revolutionary Spirituality”. This time around Freda is determined to think for herself; discover her real identity; trust her own intuition; give up care taking for good; and experience the freedom of living outside of the box. Whether in a church, a classroom, an auditorium, or a nightclub, Alfreda Lanoix is determined to speak and experience her own truth, even if that means she has to go to hell to do it.